Barclays Embeds Contactless Chips in Bands for Brand-Name Watchmakers, Hoping to Boost Payments Wearables | NFC Times – Near Field Communication and all contactless technology. 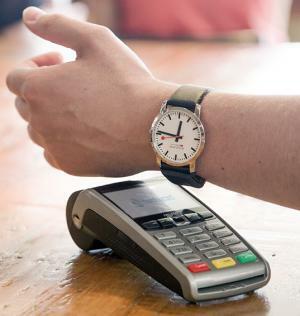 Switzerland-based Mondaine is one of several watchmakers enabling customers to tap to pay with their watches using contactless payments technology from UK-based Barclays Bank. Barclays is trying to expand the reach of its bPay payments wearables program. While payments wearables have taken off more slowly than the payments industry had anticipated, Barclays and its Barclaycard unit are moving forward, trying to capture market share with bPay by associating the payments wearables technology with such well-known watch brands as Timex, Mondaine, Guess and Kronaby. The watchmakers, most of them selling analog devices, embed bPay chips into fashion watchbands and fitness trackers. And NFC Times has learned that an eighth partner, fitness tracker Nuband, has also signed on with bPay since Barclaycard’s March announcement of partnerships with the seven watchmakers, which also include Suunto and Adexe, along with watch-strap supplier LBS. Nuband has embedded bPay chips into its Nuband X-Pay fitness trackers.